I know I know, the title sounds dumb. But hear me out. My friend RabadonDeathcap from Epona server bought a mount for 1.75 mil that was apparently scammed from someone, but he didn’t know. 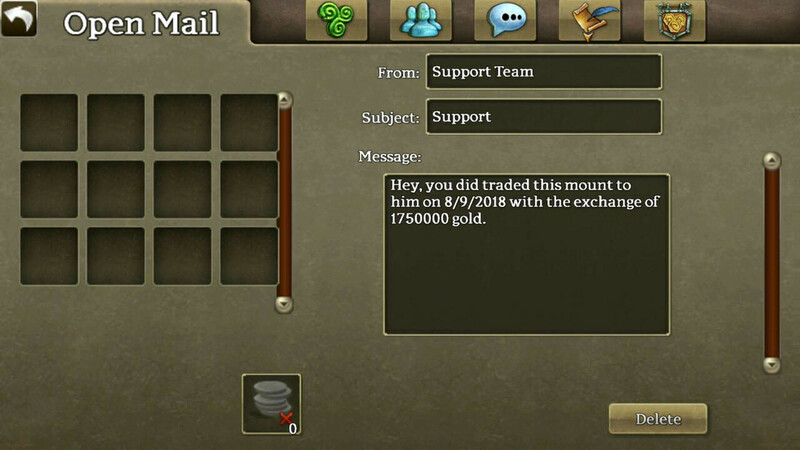 OTM/CH support took the mount without returning the gold. So naturally, he requested for his gold to be returned since he was ripped off by the system. So as you can see, OTM/CH Support rejected his request for no apparent reason. Can you return his Gold or refund him with platinum? Thanks. From the ss shown it looks to me like the mount was traded away, not confiscated by VR and thus VR cant return the gold. Do you happen to have a screen shot that would indicate that it really was confiscated? SupremeDruid wrote: From the ss shown it looks to me like the mount was traded away, not confiscated by VR and thus VR cant return the gold. Do you happen to have a screen shot that would indicate that it really was confiscated? Raba was notified that the mount was previously scammed before he bought it. So Support decided to take it away. The gold shown is what he paid but didn’t get refunded when the mount was returned. So he’s down 1.75m because they returned a previously scammed mount..
Raba bought the mount from someone unknowingly that it was scammed. A couple days later support said the the mount had been scammed and they were taking the mount from his inventory. He messaged back asking if he could at least get his 1.75 mil he paid, as he also borrowed a mil from a clannie to buy it. That is when support messaged him back with those ones seen in ss’s. “They can not reverse trades” and they “can’t disclose name” as epona steps in with cases of scammers, even when otm can not, and bans them from rolling at bosses(something that will make any normal player simply quit playing. Interesting, deff doesnt seem right that vr should punish the purchaser for not knowing better. If they can take the mount from raba and return to original owner idk y they cant take the gold from the scammer and return that to raba. Might wanna see if VR support actually sent that mail. Odd that they would reverse one trade but not the other. Supports gone well down hill since VR took over, I predicted it when otm went and it's come true. Let's just hope there better at developing a game. Plus, tell them u don't want a trade reversing, tell them u want a reimbursement. Lol this sounds awfully ridiculous. I hope you/your friend get ur gold back or even better get the actual mount back. Support should be strict. Either reverse ALL trades (that are proven a scam of course) or never reverse any trade. No exceptions.